This week has been slow and I was working on one of my stitcheries. Then I decided to make a pillow for my beach room and yesterday, I spent most of my day, working on it and finished the pillow top and today I was able to sew it up. It is a design by Kathy Schmitz for her One Stitch Club, and I made a small pillow but this one is 18" square and a start for my pillows in my beach room. I wanted to use blue jean appliqué with rough edges, but not sure if they will fray too much, I used iron on fusible, so maybe I need to do the larger ones without? I changed the design up a bit to fit the size and kept it simple, I don't want the pillows to be basic, this one is more than I planned. The others will be a simple blue jean appliqué shape in the same style pillow, in a 20". I saw similar ones in a store and they were asking 60.00 for one, so it is nice to be able to make my own. 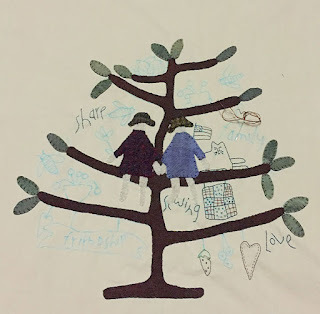 I am also working on a stitchery by Cheri Saffiote, a freebie pattern for her Facebook Group. 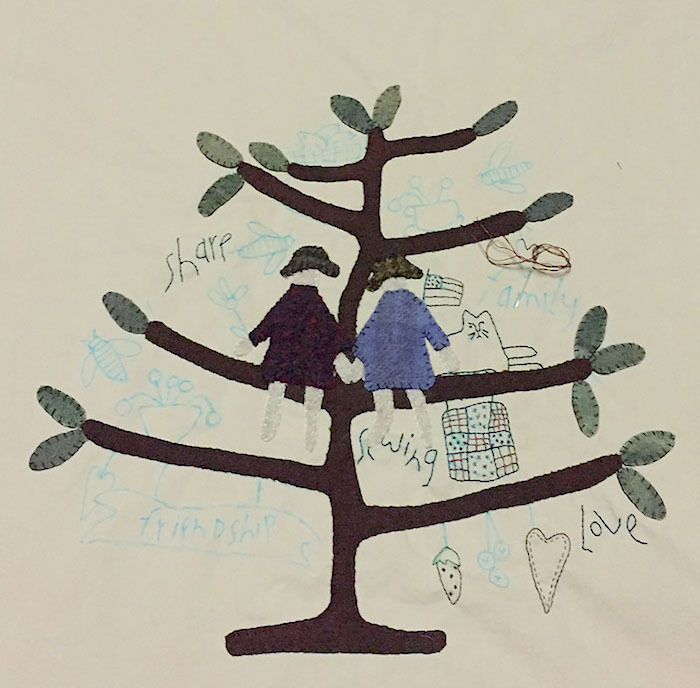 I am making this as a gift and later I will add the names to it, but for now I need to finish the main stitchery and then decide on a border. I hope you all have a nice weekend. I found a place that will take our old VHS tapes and put them on disc, so we will start out with a few at a time. It is only 10.00, but I want to try a few first and these I know have our kids on them, the rest we will have to sit and watch to see what is on them. Great finishes. I love your pillow. Total #CreativeGoodness. Love the whale pillow!you did a wonderful job on it. Your Cheri piece is coming along nicely also. Hope you have some good weekend weather to get out and enjoy. The whales pillow is oh so good! The denim seems to work well and a little fraying would add more prim style to it so I would not worry about it if it happens. Did your blog used to have a sailor at the top instead of the angel and ship? I just live that whale pillow. The fused applique seems to have worked fine. You are always so productive. Ilove the pillow. Great idea to transfer the vhs tapes. 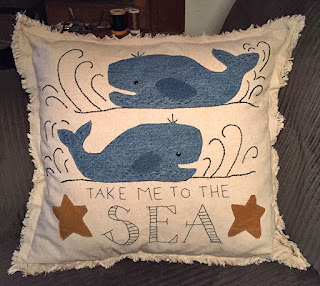 I love your whale pillow!